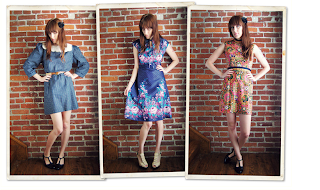 I stumbled upon Sally Jane Vintage's blog tonight. Wow. Check out this stuff she posted on eBay on Friday. I would like to put on the record that I'd like to own each and every one of the 15 items she's posting. SJV giving Maegan a run for her money in these photos. Talk about fierce (and eccentric-fashionable... just my speed). p.s. found her eBay listings on her site, here. My younger brother Paul and I had the greatest time together today. We hit up a few thrift shops, an antique shop, the Indian beauty salon and Nakato. We laughed. We cried. We played dress up and modeled with dogs. What a day! First, we started out at Natural Identity Beauty Architects. As I mentioned a few months ago, Natural Beauty offers awesome eyebrow threading for $5 (used to be $4). Paul and I were both in drastic need of some eyebrow recon... so we sat and endured the pain for a few minutes (i.e. this was where the crying took place). 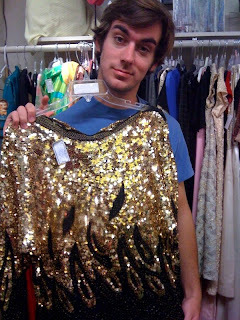 Since we were right next door to Last Chance Thrift in Decatur, we couldn't resist going in and scoping out the merch. Paul didn't find anything (sad face!) but before rushing out to meet our friend Lisa for lunch, I managed to find a cute wool skirt. I'll keep this in hibernation until the fall, when I'll ideally have a crisp, white, long-sleeved button up I can wear with it. 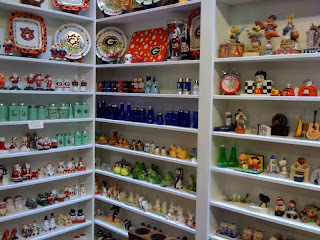 After breaking for lunch, we headed onto Kudzu Antique Market for it's 20% off sale. 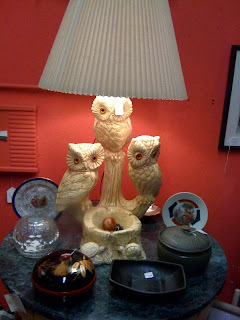 Kudzu has all kinds of awesome furniture, jewelry, clothes, art, knickknacks, memorabilia — most of which is vintage. Love, love, love looove this place. I can't believe I'd driven right past this gem for years, until my boss mentioned its awesomeness to me back in July. Individuals and small companies rent out booth space — with Kudzu acting as an operator and cashier and taking a small portion of each sale. Looked cute on the rack, not so much on. "May I offer you a slice of apple pie with your all-star breakfast, m'am?" 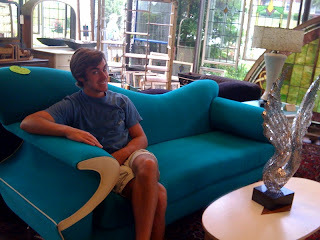 This couch was labeled "Cool Jetson's Couch"
Of course I had to find and find the one thing not 20% off. Next stop: Goodwill at Northlake. The store was abuzz with activity! We fought our ways through the racks to find some pretty rad stuff. 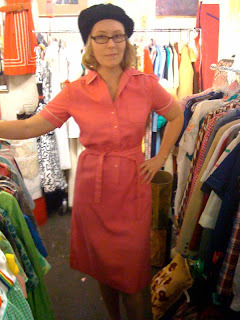 Paul scored two Polo shirts — and Paul found me a vintage Lacoste shirt and I found myself an 80's cocktail dress (...to sell on eBay or to keep for a later party? That is the question). 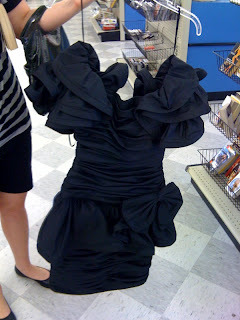 And we had just enough time to stop by one more Goodwill, this time the Brookhaven location on Buford Highway. I found a kick-a$s Armani Exchance casual jacket (would retail for $120 new, no doubt). 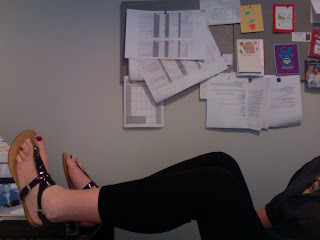 Another good find: a pair of Limited "Drew Fit" slacks. Paul found another Polo (are you sensing a trend here?) for another solid $4.70. I either have lots of styles or no style. 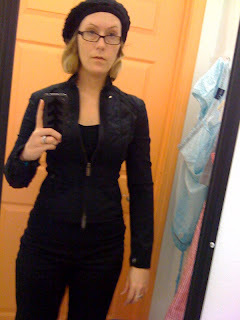 I'm not sure which it actually is... anyway, my style "open-mindedness" led me to find several fabulous things today. Paul fared pretty well today also. 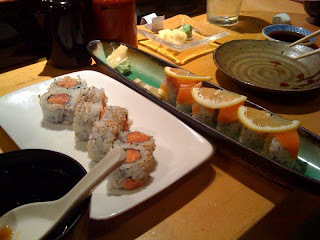 And after a day of shopping and silliness, is there a better capper than delicious sushi? I think not. I don't want to put words in Paul's mouth, but I think he'd agree. We enjoyed miso soup, veggie tempura, octopus nigiri, amberjack nigiri, an eel roll, super crunch roll, spicy tuna and california roll. Mmmm. 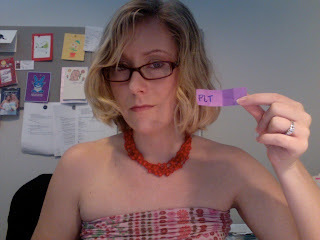 Unless you think I'll show up to your house and steal your fab Goodwill finds, PLT, please e-mail me your address (or the address of a friend you trust - ha). katy.mallory at gmail. Can you really call something a contest if only three people have entered it? Oh well, that's kind of hilarious in of itself. Tomorrow I'll draw a name out of a giant hat... and someone will be the proud new owner of my wrap dress (with a promise to post pictures wearing it then offer it up to another blogger, of course). originally thought. So ugly it's cute? Do you ever find yourself picking out items that are so ugly that they're (somehow) cute? I know I do. There's something intriguing, hideous, ridiculous... and adorable about really wacky/far-out items, especially accessories. This oversized lacquer-covered wooden bird necklace fits the bill. When I spotted this funky piece with its strand of various beads (some reminiscent of pink disco balls), I knew I had to have it. Since I was at the Raleigh flea market (cash only) with only a debit card in tow, I had to borrow $3 from my dad so I could take this home. As I was laying in bed last night with the most bizarre stomach cramps I've ever experienced, I came up with a second life idea for my wrap dress. Let's be honest. Now that Megan's birthday has come and gone, I'm never going to wear that thing again. But I have a feeling this very hodgepodge of acrylic fabrics is still capable of creating much more laughter (or public humiliation — your call). So here's what I propose: let's keep this thing moving around the blogosphere. I'll send you the dress and instructional DVD — with the requirement of posting pictures of course — then you pass it along to one of your readers to do the same. Can't you just imagine all the silliness that will ensue? 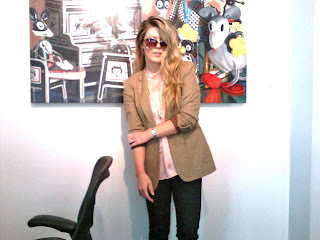 So, post a comment to this entry if you're interested in being the next brave fashion victim (or pioneer?). After a week, I'll draw a name from a hat and contact the winner (or should I say "loser?"). Seeing Maegan's locks at Love Maegan is pushing me over the edge... I think I'm going to go long again. Maybe I didn't know enough about how to style my long, curly-ish hair. And I don't think I had enough layers cut in it before I gave it the big whack. I didn't watch Napoleon Dynamite for about three years after it came out. When the flick was all the rave in August 2004, I couldn't help but think that I would be disappointed when I eventually saw it. I mean, every blog, magazine cover, friend and foe was talking about the flick. So I waited. And when I did finally watch it, I'll admit that I thought it was funny. Well, I should have waited to hit up the Atlanta food talk of the town — Varasano's. Jeff Varasano and his pizza recipe took the food/restaurant blogosphere by storm, especially over the past few months as his eagerly-anticipated restaurant prepared to open. (Read some of the history here and here). To his credit, it seems Varasano has dedicated a lot of his life to perfecting and investigating his pizza craft. The restaurant's setting below the Mezzo Condominiums (across the street from Justin's on Peachtree) was trendy, hip, vibrant, posh and maybe trying a little too hard. But how about the food? Overrated or worth the hype? The simple menu looked to have some good options. Dan and I split a caprese salad (a favorite antipasti of ours) for $6.95 and our dining companions also split one. The balsamic drizzle was perfectly seasoned and the tomatoes ripened to perfection. A delicious opener to our meal. We also shared a bottle of well-priced ($22) South African red (I didn't write down the name — whoops). For my main course, I chose the salumi pizza ($14.95). I'm a sucker for thin-sliced, cured meats — and this pie featured several plus spiced olives (another love). Dan ordered the pepperoni calzone (pepperoni, sundried tomatoes and mozzarella) for $12.95. From his last visit to the pizzeria, Derek remembered the calzone didn't come with a side of pizza sauce — so he asked for one and recommended Dan do the same. Our pizzas came out to the table promptly, smelling and looking delicious. We took a few bites before our waitress returned with two ramekins of pizza sauce. She warned us that because they had no microwaves on site, the simple sauce would be cold. A cool temperature I was okay with; the sauce itself had less flavor than a can of Kroger-brand tomato sauce. After tasting the sauce base by itself with my fork, I couldn't get past its not-so-inspired flavor. The crust, however, I must say was delicious. Doughy, flakey and not too heavy, every bite of the crust was enjoyable. The pies overall were okay. In the end, the food (not the hype) is what's going to keep a restaurant in business. Would I go back? I suppose — but I would consider Varasano's to be just another one of the decently good pizza places in Atlanta. We're also spoiled that we live so close to Shorty's. 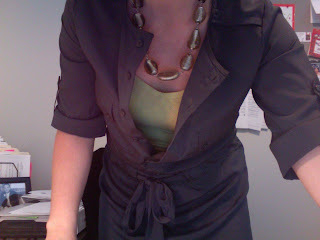 Digging this Mossimo tunic-style top from Target. Get it here. Also in black and coral. I returned something to Target Wednesday night and got a store credit in return. What's a girl to do? Buy laundry detergent, deodorant, milk, toothpaste, etc.? Hell no. Check out the women's clothing department, of course. I snagged this grey tunic-style top from Target (Mossimo) for $21.99. I'm quite excited about it, actually. I'm thinking this could go over a swimsuit, pair of jeans, mini skirt or leggings (like I did today). The rest of my clothes were shopped from my closet: Target tank top, Target necklace, Rainbow leggings (yes ladies, I said "Rainbow") and Ross shoes ($10.99). Who says you have to spend a lot of money to wear something fun? Anna, thank you for this fab necklace you gifted me with a few Christmases back. It's perfect. To see someone who really knows how to do this mac photo booth thing right, check out Love Maegan's blog.